I’ve been reading the forums for a while on a variety of topics. Now looking to get my first dust collector and I’m trying to decide on the filter system to use. I’m pretty set on doing a modified 2 HP Harbor Freight system based on what I’ve read here. I’ve noticed that a lot of people have purchased cartridge filters from Wynn Environmental. I was searching for alternatives and found www.damnfilters.com . Has anyone ever purchased a filter from them or does anyone know about the quality of their filters? For what it’s worth, they say their cartridge filters are American made. 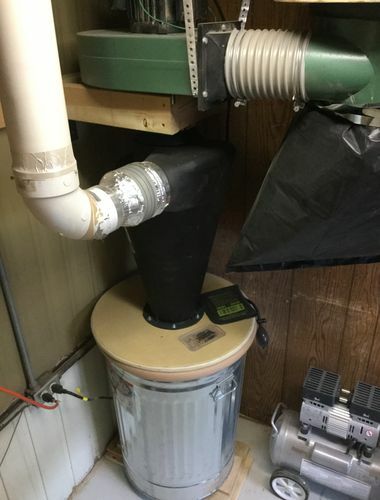 I’m hoping to do MERV 15 filter, which they carry for a variety of other dust collector manufacturers and for less than the $200 Wynn filter. I have had a Harbor Freight foe 4 years now. I had a Wynn and didn’t like it because it was hard to clean and it started leaking after about a year and a half. I bought a filter from Grizzly that fits the HF. It’s the one that has a crank handle you turn to clean it and it works great. Cost if I remember was about $220, but I got it when they had one of there 10% deals. The best thing is the crank handle. Works great and you don’t need to blow compressed air thru it, which can damage the Wynn. There item number is H5783. The current price is $235 plus shipping. Look at shipwright’s setup. He uses a large diesel truck air filter instead of the Winn – much less expensive. Sometimes I’ve seen them on amazon warehouse deals – just get a big one and make whatever adapter is needed. Turns out it costs more to ship the HF blower here (Alaska) than the blower itself costs so I’ll have to figure out a different setup or buy one pre-assembled. Noted on the Wynn filters—I’d read elsewhere about the filter cleaning issues. I’ve also read, however, that the paddle system used by Grizzly, Jet, etc. can damage the filters. Ocelot, thanks for the tip. I’ll definitely look into the diesel truck filter option and check out Shipwright. My experience is that the Wynn’s are worth the money, and their customer service is excellent. The real issue is whether the effective CFM draw from the HF Dust Collector is sufficient. The 0.5/0.3 micron filters require a lot more umph than a 5 or 1 micron bag or canister. The effectiveness of a DC system is more than just ‘stated’ horsepower and ‘stated’ CFM. Here’s my HF system with Donaldson filter. It works as well as the bigger Wynn filter. I have since added a super dust deputy and now I don’t get anything at all in my collection bag I am assuming that means that I’m not clogging my filter either. I have bee; using it a lot since and haven’t noticed any suction loss. Hello, following up on this link as just had a HORRIBLE and ARROGANT interaction with damnfilters.com. I cannot recommend enough that you DO NOT do business with this company. I was interested in a filter for upgrading my dust collector and saw they had advertised free shipping (with some restrictions) for new users. 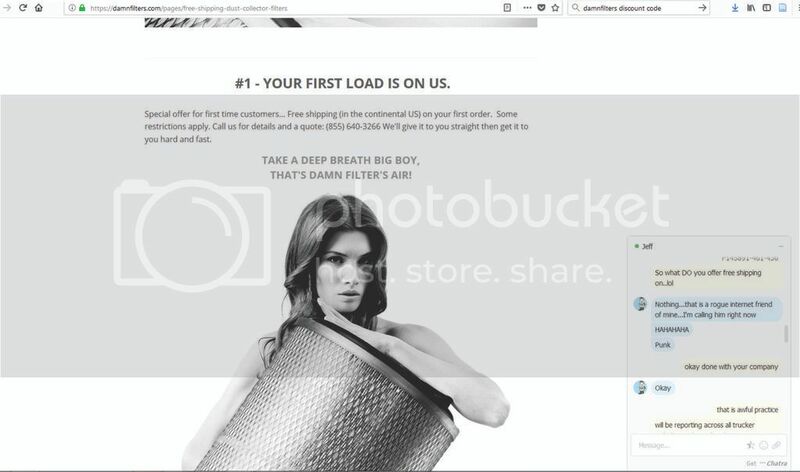 Upon checkout, there was no free shipping on the filter from damnfilters.com (Damn Filters). I very much respect that “some restrictions” was listed and would have happily accepted that as the answer. But through chat with the company received nothing but excuses and arrogance. 1. When told the item had no free shipping, I asked what does. I was specifically told NOTHING. While I respect there should be “some” restrictions..nothing implies false advertising. 2. This was blamed on a “punk” of an internet/website developer and no responsibility by one of the chat representatives/owners “Jeff”. Which at best represent incompetence of management and again at worst deceptive business practices. When informed the website has now been altered, good for them, but lets see if it stays down. Overall received nothing but arrogant mocking from the website regarding THEIR error. I am still trying to track down the parent company to complain to the BBB but do not believe they are even registered – that says a lot. There are a lot of good, reputable companies to buy filters from and it is clear DAMNfilters.com is NOT one of them. Avoid at all cost and please share this on as many websites as you can. Lets get the word out! Screen captures of the website and chat are below. My experience is that the Wynn s are worth the money, and their customer service is excellent. The real issue is whether the effective CFM draw from the HF Dust Collector is sufficient. The 0.5/0.3 micron filters require a lot more umph than a 5 or 1 micron bag or canister. The effectiveness of a DC system is more than just stated horsepower and stated CFM. Actually, since there is so much more surface area for the air to exit, despite being a finer fabric, the canister filters provide less resistance to airflow than the bags. It is often necessary to throttle the inlet of the fan to keep it from overamping due to reduced resistance. That was true if my HF unit with Wynn filter. I eventually added the woodcraft trashcan chip separator and that provided enough pressure drop to stop from popping the breaker, and I no longer have to pinch back the blast gate. Call me old school (ok I am old), but I only do business with websites were company address is listed on web site. Why? Delivery time: Sometimes I want it fast. When things go wrong: Know city and location where I register a BBB complaint. I want my family to know where I will be arrested for taking my revenge on a stupid person. Damn filters site has no address listed on site, they are removed from my sourcing list without out a second thought. With a name like that, I would never even consider doing business with such an organization. I’ve seen products from both companies. I have the Wynn filter on my Harbor Freight dust collector in my shop, and the metalfab company where I work buy their filters from Damn Filters. Both products look and perform very well. In terms of customer service, we are talking apples and oranges here. Wynn specializes in small woodshop dust collection. Damn filters is manufacturing and selling directly to large industrial companies with fleets of dust collectors. I know, for a fact, that they could care less about selling one or two filters at a time to small shops. (I’ve asked them about a replacement for my HF.) These guys are used to dealing with crotchety supervisors and purchasing departments buying 10 to 100 filters at a pop. I’d give them a break about not wanting to send you a filter that costs more to ship than it does to make. My company changes out filters, 12 at a time, every 6 to 9 months. We’ve never had a quality problem with the damn filters and we’ve saved quite a bit of money by using them over the big name manufacturers. The cost to performance ratio is fantastic. But again, we’re talking industrial scale here. Bonus, our purchasing gal always gets a chuckle her when the tell her to order the “damn filters”. Yea, I have NO issue if they don’t want to include free shipping. My problem is that they advertised they did. And when asked – they said nothing qualifies for no shipping. That is just downright deceptive. We are also not talking a one line entry somewhere, but point #1 of 5 they listed as reasons to buy from them. The attitude over what could have been an honest mistake was disgusting. Thanks for all the insight and input. I was able to get the HFDC after all during a trip to the lower 48. I unintentionally decided on a setup very similar to that in Shipwright’s post but will vent outside in the summer and likely use a cartridge filter in the winter. Based on the comments above, haven’t decided whether to gamble on Damn Filters yet. I have two DC units. One is a Delta with the Wynn, the other is a HF with the Donaldson filter. The HF unit is hooked to my jointer & planer only. The Delta is hooked to my fine dust producers (saws, sander, router). Both filters work very well as intended. Both units have the same Thein design separator connected to them. Neither unit allow dust to into the collector bags provided the dust bin is not over filled. I have installed little windows into the side of the garbage cans to watch the levels. My shop is in the basement so effective dust collection is not only critical, its very visible! There is a physical size difference between the two filters but I believe they have the same merv rating. I have not tried swapping the two filters around but the smaller Donaldson filter tends to retain more particulates within it than the Wynn does. I have had the the Wynn setup for over 3 years now and am very pleased. I probably do more work than the average hobbyist, but less than a full time pro. I added the HF unit about a year ago but the Donaldson was just added about a month ago. The other difference between the dc units is that the HF unit has a larger collection bin as it collects mostly large sized particles. I have not noticed any differences in the amount of dust that escapes either of the filters. Which is what is critical. But I do have to do a bit of a filter cleaning with each bin full of dust I collect especially on the Donaldson. My suspicion is that the smaller filter is the reason. But at 1/4 the cost of a Wynn filter shipped, I’m more than willing to do it! It was the cost differential that had me get the Donaldson filter over another Wynn. Cost is why I have two used DC units vs. one bigger unit and why I didnt use super dust deputy cyclone units vs. my Thein separators. Both units with all modifications included cost me less than $500 total. P.S. I used to double filter bag my HD unit which worked fairly well initially, but found out later on that once the second bag got saturated with fines, it would then send them into the air. That is the main reason why I added the Donaldson cartridge filter. The cartridge filters have better Merv rating to them and do not spew visible fines accordingly. I wish I read this before ordering from Damn Filter (aka Kansas Filtration LLC.) ... It’s been over 3 weeks and I have not received my filters. Every week a promise that its been shipped. Big on changing the OEM technology (which causes you to lose your warranty). Damn filters lead time was longer than expected but the product was quality. I say it’s a toss up.